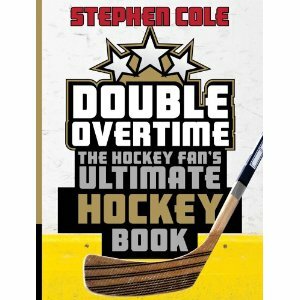 Stephen Cole is back with his latest book release, Double Overtime . At first look, this book struck me as an eclectic collection of stories and photos, some neat and interesting and some not so much. It appeared to me to be the type of hockey book some publishers like to produce more to tap into the cluttered big box store markets rather than to add much to the world of puck literature (which is kind of funny given that the book is dedicated to hockey writing legend Trent Frayne). That's pretty harsh commentary. It is also not entirely accurate. Upon further review of the text, the more impressed I became. There are some well written essays, one for every team. You can learn about Vancouver's other famous hockey brothers, hockey's most famous fight, New York's hockey rivalry, a look at a young Wayne Gretzky, and hockey's unique place in Nashville. There are some very unique and interesting photos and imagery of memorabilia. Yes, it is very eclectic and random. But every fan will find no shortage of interesting contributions there. What might be most interesting is that your photos could be the highlight of a planned follow up title in 2012. Check out the book's website, www.doubleovertime.ca. It is interesting in itself. You can submit your own fan photos which might be included in the planned follow up book in 2012! How cool is that? You can also visit the Facebook page to win a copy of this year's book by entering their caption contest. You can also talk hockey in the fan forums where you are also encouraged to share your photos. All in all, I still think this is the type of book you will see at every Wal-Mart and grocery store as we head into Christmas. I suspect we will see it on the reduced to clear racks not long after that. But there are some interesting gems inside, so do not initially dismiss this book like I did. All in all it will be a popular choice to be wrapped up under the Christmas tree for the more casual hockey fan. The book's interactivity via the website and Facebook is interesting. I will be curious to see if my photo is chosen for the 2012 book.